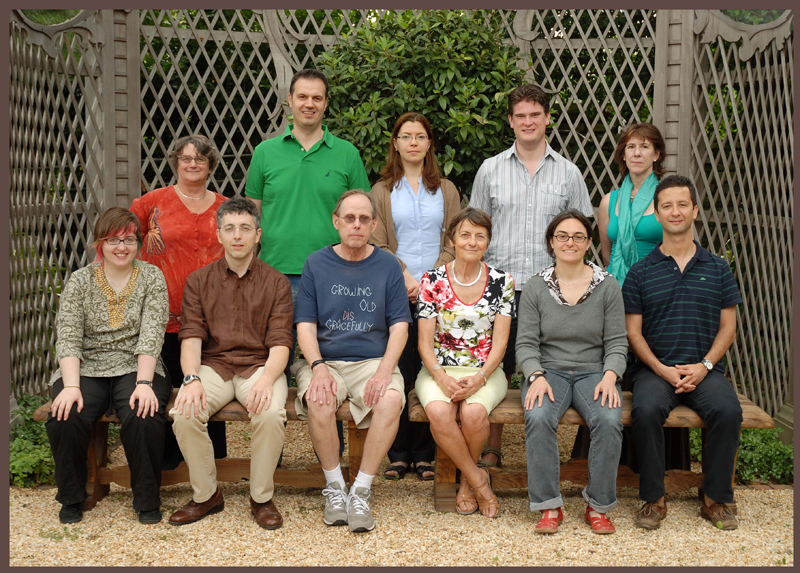 After extensive building work for a new Library and the complete refurbishing of the Main House, the summer program in Byzantine numismatics and sigillography was held for the third time at the Dumbarton Oaks Centre for Byzantine Studies in Washington DC. The course introduced seven participants to coins and seals through a one month program of teaching and research. The core of the program was, as before, a series of seminars given by Cécile Morrisson on coins and John Nesbitt on seals, drawing on Dumbarton Oaks' extensive collections for illustrative material. The program also benefited from the presence of summer fellows and readers: Rina Avner (Israel Antiquities Authority) and Öguz Tekin (Istanbul University) discussed the importance of coin and seal finds in their own excavations in Israel and Turkey respectively. Catherine Saliou (Université de Paris 8) presented a detailed analysis of the topography of Antioch and Aglae Pizzone (Università degli Studi di Milano) offered an account of the importance of phantasia in Byzantine thought. On a practical front, Joe Mills gave a guide to digital photography, Pagona Papadopoulou (Princeton) presented a seminar based on her own experiences in forming and manipulating databases and an introduction on electronic resources in numismatics, Alex More (Harvard) conducted an invaluable workshop on GIS mapping and Joel Kalvesmaki (Dumbarton Oaks) gave an introduction to specialist fonts, including the Athena and other fonts designed for the DO Catalogues of Coins and Seals, which it is hoped will be made also available in Unicode format. In the final week the participants had the opportunity to present projects undertaken during the summer program, chosen to complement their individual research interests. Rebecca Day (Birmingham) introduced the subject of Byzantine coins in south India and Sri Lanka; Andreas Gkoutzioukostas (Aristotle University, Thessaloniki) gave a detailed account of Greek seal collections and of the current progress of the database project, with which he is involved, to catalogue seals concerning the themes of Thrace and Macedonia; Luca Zavagno (East Mediterranean University, Cyprus) reinterpreted the role of Cyprus during the reign of Heraclius, based on coinage evidence and thereby suggested a more positive interpretation of economic networks in this turbulent period; Irina Tamarkina (Durham) suggested the possible utility of tenth- and eleventh-century seals for understanding the developing emphasis on lineage in Byzantine onomastic practice; Ece Turnator (Harvard) used the evidence of Turkish excavation reports to plot the circulation of different denominations of twelfth- and thirteenth-century coinage in Asia Minor, which raised important questions about the interaction of government policy, production of commercial goods and the circulation of currency in this period; Jonathan Shea (Birmingham) re-reexamined the Longuet Salonica hoard, now the property of Dumbarton Oaks, using overstrike analysis to suggest improvements on the chronology of coin types proposed by Bendall in his reexamination of the hoard in 1984; and Yaman Dalanay (Oxford) presented a detailed survey of the archaeology of Ephesus, including the evidence of Byzantine seals, to support his challenge to the prevailing view of the decline of the city, and the resettlement of the Greek population away from the ancient site in the seventh century. The thanks of all participants go out to Cécile Morrisson and John Nesbitt for creating and delivering a superb course, to Margaret Mullett, Director of Byzantine Studies, for her enthusiastic involvement and insightful questions and discussions, and to all of the staff at Dumbarton Oaks for a wonderful month. Class List: Yaman Dalanay, Rebecca Day, Andreas Gkoutzioukostas, Jonathan Shea, Irina Tamarkina, Ece Turnator, Luca Zavagno.